I have AT&T DSL (6mbps), and using their Wireless Router/Gateway Combo (2wire 2701HG-B). 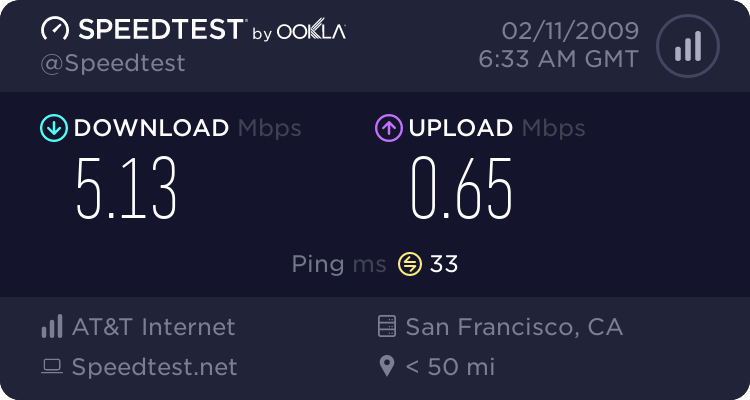 So when I plug in the Ooma Hub to the Ooma splitter to the wall, my DSL connection is drastically slow. For example, pinging Google when not connected is 13ms, and having it connect ranges from 200ms to 1000ms. ...everything works, but of course the Ooma Scout does not work. But if I remove the DSL Filter, both Ooma Hub and my 2wire gateway fails to connect to their respective services. In other words, both devices are data colliding with each other. So my question is...is there any solution? I know that the Ooma Hub and Scout both communicate on HPNA, but so does AT&T and 2wire if I am not mistaken. Is there away to alter their frequency/channels? Or is their any other layout that wouldn't make my internet slow and still have the scout work? Last edited by ktr on Sat Feb 14, 2009 1:58 pm, edited 2 times in total. It's a bit unusual to have a DSL filter before your modem -- normally you only install DSL filters for any analog phones you connect in your house, since most modems have some sort of filter installed in the unit itself. Is there a model # for the DSL filter you're using? Thanks for the quick response Bobby. Here are pics of the DSL filter that I am using before the gateway/modem. If I use the Ooma splitter...plug one port to the Ooma Hub, and the other to my gateway, both Ooma Hub and gateway cannot connect to there respective servers. Now if I replace the Ooma splitter with the DSL filter shown above, everything works, but now the Scout becomes a paper weight. Everything works including the scout, but the internet is slow like a 56k connection, but the Scout's voice mail sounds like garbage & the telephone calls cuts out/no dial tone. Wow, thanks for the snapshots - those are useful. Also, can you grab the model number of your modem? In the above, It looks like the gateway is requiring the filter to be in place for some reason. What happens if you plug the DSL modem and ooma Hub WALL port into the two ports of the ooma Splitter and then plug in the ooma Splitter into the "HPNA/DSL" port of your DSL filter and then plug in the DSL filter to the wall? Does that work, or do you also get slowness? Also I did plug the Ooma Hub and modem to the Ooma Splitter, then plugged the Ooma Splitter to the DSL/HPNA port of my DSL Filter, and the internet is still very slow (loosing packets)...see the speed test. OK, thanks for running the tests. One last thing to try is to replace the ooma splitter with just a regular phone splitter (you can pick one up from radio shack or fry's) and see if you still experience the slowness. There's also a few other options -- you can try running the Scout on a separate line in your home. Most homes are wired to support two lines (though you might only need to a couple 2-line phone jacks to install or a 2-line splitter). You can also try asking your DSL company for a newer or different modem. Most newer modems should not required a filter to be placed on the outside of the modem for the DSL connection to work. For whatever reason the HPNA signals seem to be interfering with your DSL connection, though this should not be the case. I don't know if this is possible in your situation, but here is how I installed my Ooma service. I ran a new line from the NIB (Network Interface Box- the box on the outside of your house where your phone service connects) directly to my DSL modem and installed a surface wall jack to plug into. (100 ft roll of wire was $12 at local home improvement store, jack was $5). I then disconnected the home wiring from the NIB to ensure no current from the phone service and plugged the "phone" jack on the hub to the wall plate for the home wiring. Worked great and no need for scout as the home wiring all connects to the hub. I also had a little trouble with my router connecting to the internet, so changed the hub settings to a static IP address and it now works fine. There are plenty of articles in the forum addressing how to do this. Bobby B wrote: OK, thanks for running the tests. One last thing to try is to replace the ooma splitter with just a regular phone splitter (you can pick one up from radio shack or fry's) and see if you still experience the slowness. Okay, I will get a regular phone splitter and pick up a pair of 2-line splitters. The 2-line splitter makes sense...as the modem will use the two inner pairs, and Ooma Hub/Scout will use the outer pairs. Also, the modem doesn't need the filter to work. What it is a regular phone splitter, where the phone port is actually filtered, and the DSL/HPNA port is a straight through. And the modem is the latest and suppose greatest router that AT&T has to offer. Please let me know how it goes since I will have the exact same modem when I switch to DSL. Do you have phone service on that line as well? I will using a dry loop once I get my old ATT number ported. So everything is fixed now. What I did was install the 2-line splitter on where the Hub is and the Scout is. Then I went to my telephone network box outside...and installed the ooma splitter to the demarc jack of line#1 module. Then plug the line#1 module's rj11 wire to the ooma splitter. Then I installed a DSL filter to the other port of the ooma splitter, and plugged line#2 module's rj11 wire to the DSL filter. This way line#2 has a dial tone, but doesn't leak HPNA to line#1. demarc = the point where phone company connection from the street meets your house phone wiring. johnnyrod wrote: Do you have phone service on that line as well? I will using a dry loop once I get my old ATT number ported. Yes, I have a traditional land line phone service on the DSL line. I have inquired about dry loop from AT&T, they said it's an additional 10 bucks to do so. Then I inquired about the cheapest phone service, and they said like $12. So for 2 bucks more, I can get a reliable land line, and a proper 911 service. also this is how a 2-line splitter looks like..